Calf muscle pain is a common problem that can make walking, running and jumping difficult and painful. Pain in the calf region may be due to injury, underlying medical condition or a problem in the nerves or arteries in the lower leg, meaning accurate diagnosis is vital. Whilst often something minor like a grade one muscle strain, the problem may not actually be in the muscle itself and could be indicative of a serious problem such as a DVT so should always be treated with caution. Here we look at the most common causes of calf muscle pain. We will look at causes that can affect the whole calf, or cause lower or upper calf pain, how the symptoms vary and how to spot a potentially serious problem. We will also look at calf muscle pain treatment, and how the anatomy behind the calf region. These common causes of calf muscle pain can cause pain anywhere in the calf region. If the calf muscles are suddenly overstretched, some or all of the fibres may be torn, known as a calf strain or rupture. This is the most common cause of calf muscle pain. Calf muscle tears usually happen whilst playing sports such as basketball, tennis and running where the person suddenly pushes off from a stationary position or has to change direction quickly which places a huge force through the muscle. The location of pain will depend on where the calf tear is. Upper calf pain usually indicates damage near the junction between the muscle tendon and muscle belly and mid calf pain indicates a tear in the muscle belly and lower calf pain typically indicates tendonopathy in the achilles tendon, which joins the calf muscles to the foot. There are three grades of calf muscle strain, depending on the severity of the injury. Pain is usually instant and may be accompanied by swelling and/or bruising, although with a mild sprain symptoms might take a few hours to develop. If the muscle is completely ruptured walking will be very difficult. It can take anywhere from a few days to a few months for symptoms to settle down completely. In the calf strain section we look at the typical causes and symptoms as well as the best treatment options and how to make a full recovery from a calf muscle tear. Calf cramps, commonly referred to as "Charley Horse" in North America, are where involuntary calf muscle spasms occur, typically in the lower leg, causing calf muscle pain. Cramp may last for just a few seconds but in worst cases may continue on and off for a number of days. Cramp typically causes upper calf pain, but the pain may be felt elsewhere in the calf too. Calf muscle cramp is often caused by an imbalance of vitamins/minerals, muscle fatigue, diet, dehydration and muscle imbalance. Whilst in most cases cramp isn't caused by anything serious, they can be extremely painful. You may be unable to walk or move around. The best treatments for calf cramps are exercises, particularly stretches, massage, good diet and supportive footwear. In the calf cramps section we look at what is going on when the calf muscle cramps, why it happens and you'll find loads of top tips on how to treat and prevent cramp. A deep vein thrombosis can be a very serious cause of calf pain. It is the formation of a blood clot in a deep vein, usually in the calf or thigh. A DVT requires IMMEDIATE medical attention as it reduces the blood flow to the foot, and there is the risk that the blood clot could break off and travel through the bloodstream to the heart or lungs which can cause a heart attack or pulmonary embolus. The common signs of a DVT are pain, redness, warmth and swelling in the calf region. The pain often gets worse if your dorsiflex your foot (pull your toes up towards you). DVT’s often develop after surgery or periods of inactivity e.g. plane journeys, and there can be a genetic link. Muscle weakness and tightness is a common cause of calf muscle pain. Weak muscles will tire quickly if you are on your feet for prolonged periods of time, so it is important to work on both strength and endurance. If the calf is tight, it is prone to damage from increased tension, making stretching exercises vital. Exercises are the best way to combat this and it important to get the right balance of strengthening and stretching exercises - visit the calf strengthening and calf stretching exercises sections for a whole range of exercises that will help combat this. Compression of the nerves of the lower leg can cause pain in the calf, pins and needles and numbness in the calf region. The compression may be coming from the lower back where the nerve originates from, or at any point along the nerve itself. Trapped nerves are usually accompanied by changes in sensation such as pins tingling or numbness and pain often spreads. 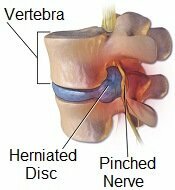 Any symptoms of nerve compression, should be checked out by your doctor. You can find out more in the nerve pain section on our sister site. 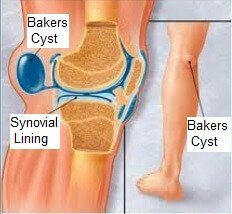 A Bakers Cyst is a common cause of upper calf pain caused by inflammation of the popliteal bursa (fluid filled sac) that sits behind the knee joint. It can cause calf muscle pain, particularly if the cyst bursts resulting in the fluid tracking down the leg into the back of the calf. A Bakers Cyst often presents as a squashy lump behind the knee, similar to an orange, that may go up and down in size. Bakers Cysts are commonly associated with knee injuries and arthritis, but can occur for other reasons. In the Bakers Cyst section we look at the typical causes, symptoms and treatment options as well as how to prevent recurrence. Inflammation or degeneration of the Achilles tendon commonly causes lower calf muscle pain. 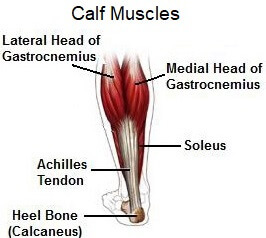 The Achilles tendon is approximately six inches long, connecting the calf muscles to the heel. The Achilles is extremely strong but not very flexible, making it prone to damage, especially if the calf muscles are weak and tight. 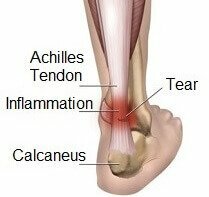 Achilles tendonitis usually causes pain in the calf or heel and there may be thickening in the tendon and calf muscle tightening. The tendon has a poor blood supply so recovery can take months. Treatment for achilles tendonitis usually involves exercises, orthotics, rest from aggravating activities and injections. Find out more about this common cause of lower calf muscle pain including causes and treatment options in the Achilles Tendonitis section on our sister site. Also known as peripheral artery disease, this is when there is a narrowing in the arteries which slows blood flow. If this happens in the lower leg, it can cause calf muscle pain. Peripheral Vascular Disease is commonly associated with smoking, diabetes, high cholesterol levels and high blood pressure. In severe cases, the foot and lower leg may change colour – this warrants immediate medical attention. To find out more about these common causes of calf muscle pain, including symptoms, diagnosis and treatment options, choose from the links above. Episodes of calf muscle pain should always be assessed by your doctor to ensure it is nothing serious such as a DVT which requires immediate attention. 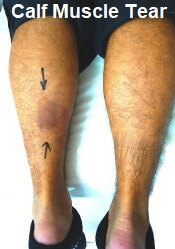 Pay particular attention to the signs for a DVT: redness, swelling, warmth and pain around the calf. Also, sudden calf pain that is worse at night or makes it difficult to walk warrants immediate medical attention. Calf Pain Walking: Calf muscle pain when walking is usually the result of reduced blood flow, and therefore lack of oxygen, to the calf muscles and usually settles down quickly with rest. Pain that persists even after resting may indicate a more serious problem such as peripheral vascular disease. Calf Muscle Twitching: A twitching sensation in the calf muscles often indicates benign fasciculation syndrome, a condition due to a harmless disorder of the nerves that activate the calf muscles. The calf muscle twitching usually stops when you use the calf muscle e.g. walking, but will often return when you rest. Calf muscle twitching can also be the first sign of cramp, or that you have overworked the muscles. In rare instances, the twitching may indicate a more serious condition such as Lyme Disease, Multiple Sclerosis or Motor Neurone Disease. Calf Pain At Night: It is very common to be more aware of pain at night as there are less distractions around. Calf muscle pain at night is often caused by nocturnal cramps which will usually wake you up. Then tend to settle fairly quickly if you stretch the calf muscles. Calf pain at night can also indicate restless leg syndrome, where you have an overwhelming urge to keep moving your legs. Calf Muscle Knot: The technical term for calf muscles knots is myofascial trigger points. This is where a small area of muscle fibres and the underlying fascia tighten forming small lumps in the muscle, like a knot. They may only hurt when you press on there, or in some cases they can cause pain at anytime for no obvious reason. They typically develop after a calf muscle injury but can also be related to poor posture, stress and prolonged inactivity. Sudden Calf Pain: The most common cause of sudden calf pain is calf muscle strain, where part of the calf muscle is overstretched causing it to tear. It typically occurs during sports and may be accompanied by bruising and swelling. Calf cramps can also develop very suddenly, either during activity or at rest. The best calf muscle pain treatment will depend on the underlying cause of the pain. If there is damage to one of the calf muscles, then usually a combination of strengthening and stretching exercises alongside a course of physical therapy will be recommended. In more severe cases, such as a complete tear, then surgery may be required. You can find out how to treat each of the calf muscle pain causes we have looked at here by using the links to navigate to the full articles on each condition. The calf is the area on the back of the leg between the knee and the ankle. It is made up of two muscles collectively known as the triceps surae. Triceps surae simply means “three-headed calf (muscle)”. It comprises of a pair of muscles, gastrocnemius and soleus. The gastrocnemius muscle has two-heads which arise from either side of the bottom of the femur just above the knee joint. It is a superficial muscle, meaning it forms the top layer just below the skin. The soleus muscle runs deep to (underneath) gastrocnemius and arises from the top of the tibia, just below the knee joint. The two muscles join together around mid-calf level to form the Achilles tendon which twists and attaches the calf muscles to the back of the heel. The triceps surae muscles work together to plantarflex the foot i.e. pull the foot downwards and stabilise the ankle. They are particularly important in controlling and executing the push-off phase of walking and running. To find out more about the most common causes of calf muscle pain, choose from the links above. Alternatively, if you want some help working out what is causing your problem, visit the knee pain diagnosis section.